A bank robber wanted for two bank robberies at a San Diego bank has turned himself in Saturday, according to police. 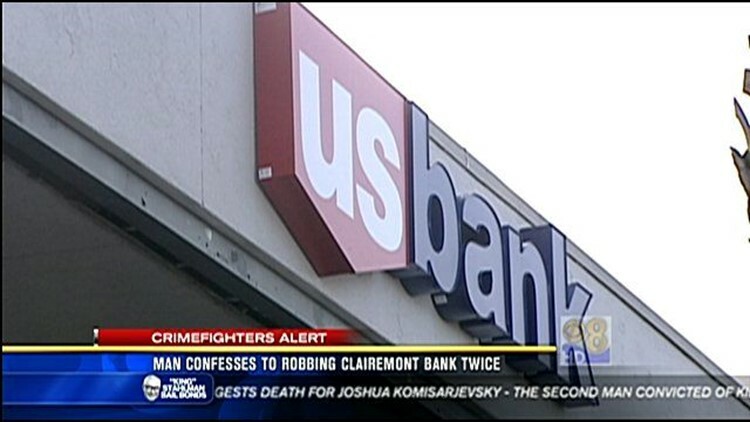 SAN DIEGO (CNS) - A 75-year-old man confessed Saturday to robbing a Clairemont Mesa bank branch twice in the past month, according to the San Diego Police Department. But San Diego police made it clear that their 75-year-old confessed robber was not the "Geezer Bandit," an elderly man who is believed to have robbed 16 banks across California in 30 months, most recently a week ago in San Luis Obispo. Police said Albert Wallake walked into the U.S. Bank location at 5407 Balboa Avenue about 10:25 a.m. and told the manager he was turning himself in for the past armed robberies, which occurred Dec. 2 and Nov. 15. The bank's manager called police and Wallake was arrested without incident, police said. On Dec. 2 about 5:25 p.m. a suspect described as a 6-foot tall white man between 50 and 60 entered the bank armed with a handgun and used a note to demand cash then fled with an undisclosed amount, police said. On Nov. 15 shortly before 9:30 a.m. a gray-haired man who appeared to be about 60 confronted a teller at the bank and pulled up his shirt to reveal a pistol tucked in his waistband and demanded cash, according to the FBI. The San Diego Police Department's Robbery Unit and the FBI continued to investigate.